Schumer | Jews Say No: Not In Our Name! New York City, May 16, 2018 – On Wednesday evening, over 300 New Yorkers with Jewish Voice for Peace – NYC (JVP) and Jews Say No! demonstrated at the NYC district offices of Senators Chuck Schumer and Kirsten Gillibrand, mourning Palestinian protesters killed by the Israeli military in Gaza since March 30 and the more than 60 killed over the last two days alone, and calling upon the senators to break their shameful silence in the face of Israel’s use of deadly force against the Palestinian people, and to support Palestinians’ rights to live in dignity and return home. Dressed in black, New Yorkers carried the names of the 111 Palestinians killed by the Israeli military while protesting in the Great March of Return in Gaza. Red poppies, the Palestinian national flower, were laid beneath a banner reading “Palestinians have the right to freedom and dignity, and the right to return home” in front of the senators’ offices. Demonstrators recited Palestinian testimonies of dispossession and expulsion from their homes in 1948, and described the last day of famed artist Mohammed Abu Amr, killed by Israeli forces while protesting. Since March 30, thousands of Palestinians have formed a tent city along the militarized fence that separates Israel from Gaza, under the banner of the Great March of Return. Demonstrators are calling for an end to Israel’s brutal 11-year military siege of Gaza and for the right to return home for refugees. The March culminated this week, with the Israeli military killing at least 60 Palestinian protesters, including at least six children. May 15 marked the 70th anniversary of the Nakba, or “catastrophe,” when 750,000 Palestinians were forcibly expelled from their homes for the creation of the state of Israel. This came one day after the Trump administration moved the U.S. embassy to Jerusalem in a shattering blow to future prospects for peace. Israel’s violence has prompted condemnations from over twenty U.S. members of Congress, including Senators Bernie Sanders (D-VT) and Elizabeth Warren (D-MA) as well as Representatives Mark Pocan (D-WI), Keith Ellison (D-MN), Barbara Lee (D-CA), and Betty McCollum (D-MN). New York’s senators and representatives have remained deafeningly silent. “Senator Schumer has repeatedly supported Israeli government aggression against the Palestinian people, including the latest assault on the Palestinians of Gaza,” said Candace Graff from Jewish Voice for Peace-NY, one of the co-sponsors of the day’s protest. “And both senators have failed to seek enforcement of laws requiring U.S. funding to be cut off to units of a country’s armed forces that have committed a ‘gross violation of human rights.’” This law, known as the “Leahy Law,” applies to the Department of Defense and the State Department. During Israel’s most recent assault on Gaza this summer, the Israeli military killed more than 2,100 Palestinians, at least 1,400 of them civilians, according to the UN, including 500 children. 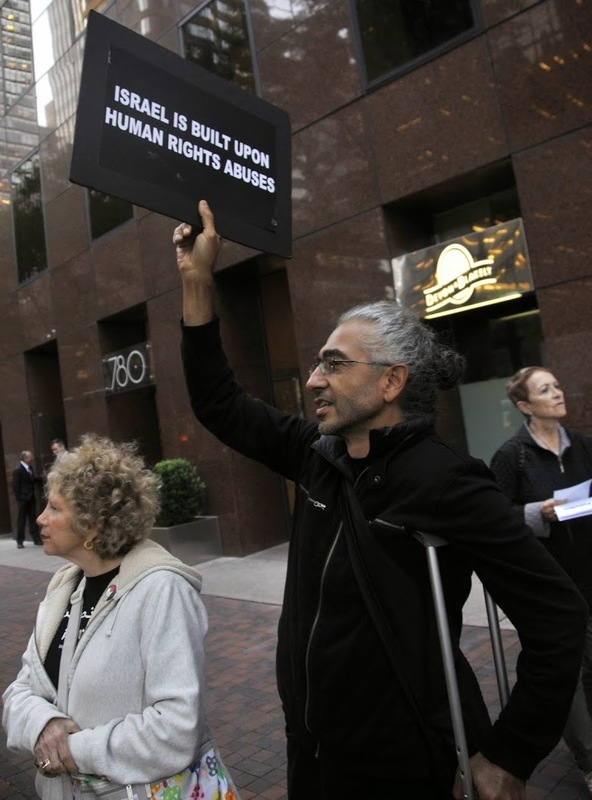 Human rights groups such as Amnesty International and Human Rights Watch have documented numerous instances in which Israeli forces violated the laws of war, employing disproportionate, reckless, and indiscriminate violence against the occupied and besieged population of Gaza, including attacks on hospitals, schools, and mosques, and the destruction of thousands of homes and civilian infrastructure. 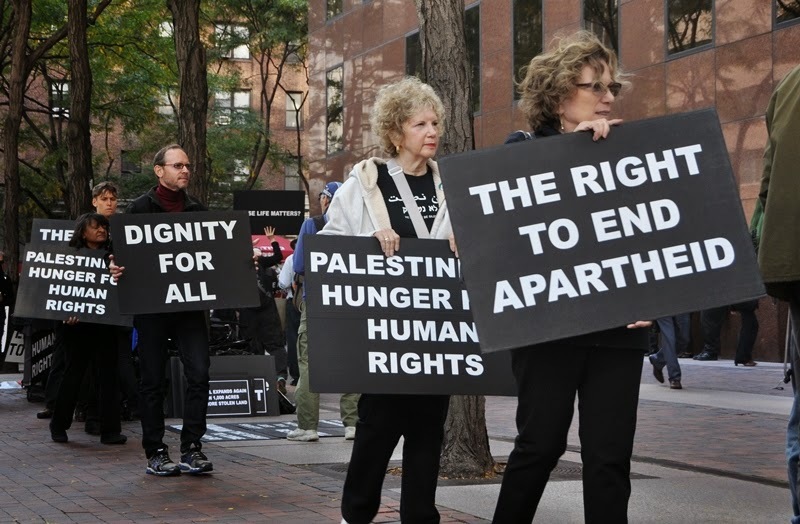 The coalition demands that both of New York’s senators hold Israel accountable to the letter and spirit of the Leahy Law, and support the holding of hearings to apply these laws to Israel, as to other human rights violators. Today is a day to make these voices heard. The day’s demonstration and events are co-sponsored by Jewish Voice for Peace/NY and Jews Say No! and endorsed by Adalah NY; Brooklyn ForPeace; Center for Constitutional Rights; CODEPINK NYC; CUNY4Palestine; Defense for Children InternationalPalestine; ; Direct Action Front for Palestine (DAFP); Granny Peace Brigade; JVP-Westchester; Middle East Crisis Response; Palestinian Rights Committee of Upper Hudson PeaceAction; Palestine sub-committee, NationalLawyers Guild; Northern Manhattan Neighbors for Peace and Justice; Queers Against Israeli Apartheid; Students for Justice in Palestine (SJP) Brooklyn College, SJP College of Staten Island; SJP SUNY New Paltz; SJP The New School; Veterans for Peace, Woodstock, NY chapter 058; World Can’t Wait; WESPAC Foundation; WE WILL NOT BE SILENT; Women in Black Union Square.